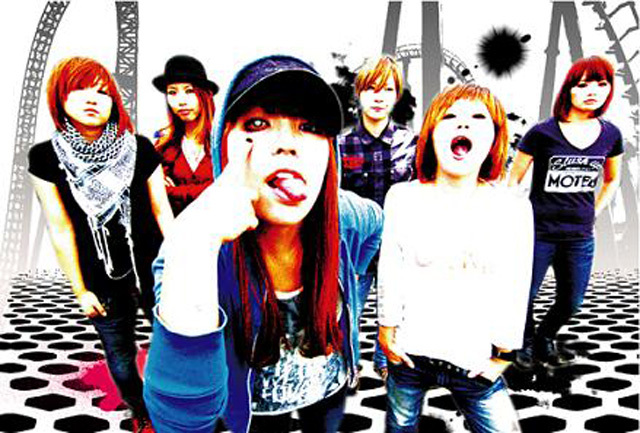 A, now popular, sextuplet girls’ band who mainly performs in Tokyo. Unlike a quintessential girls’ band, they possess virtuosic live performances and musical abilities. They weave through the realms of melodic punk and rap punk music while amassing a many fans. They have appeared in popular compilation albums such as “A TRIBUTE TO BLINK182 vol.2”, “PUNK ROCK SOUNDTRACKS vol.5”, “PUNKER SHOT 5”, and “PUNK ROCK SHOW 3”. With that momentum behind their back, released their first original EP. With their powerful sound, hard vocal style accompanied by 2 rappers, and their ability to make and perform anywhere from bright, catchy tunes to emotional tunes is a thing of beauty.